We're building a bigger, better community, and we hope you'll join us! At our practice, chiropractors in CT, Dr. Chris LaVoie and Dr. April Little have one ultimate goal in mind for patients—to offer care that's unique to your individual needs, no more, no less. Through acknowledging the problems that each individual patient is experiencing, we're able to help the nervous system heal and function exactly as it was designed. Simply put, when you choose ViVO Chiropractic for your care, you're choosing to live life happy—and that's exactly how it should be! 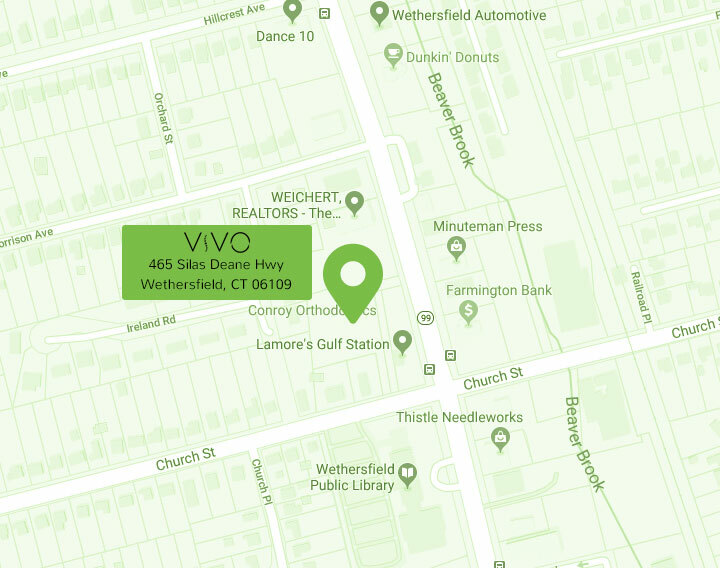 At ViVO Chiropractic, patients all across CT have access to both our Vernon and Wethersfield locations. In fact, Dr. Chris and Dr. April strive to create an environment where collaboration between doctors and patients thrive—we work together as a team to develop the best care plan for you, which means you’ve got multiple doctors cheering you on and ready to help you achieve your goals in health. Time and time again, we see patients come to our practice feeling down—and it's because they aren't healthy. Dr. Chris and Dr. April firmly believe that when you're not healthy, you're not happy, and it's their job to restore the person "under the muck". Through targeted, specific care that's designed to address your unique needs while removing disturbances in your nervous system, our team can do exactly that. It's time to live the life you love—you deserve it! Our team can't wait to meet you where you are on your journey to health. 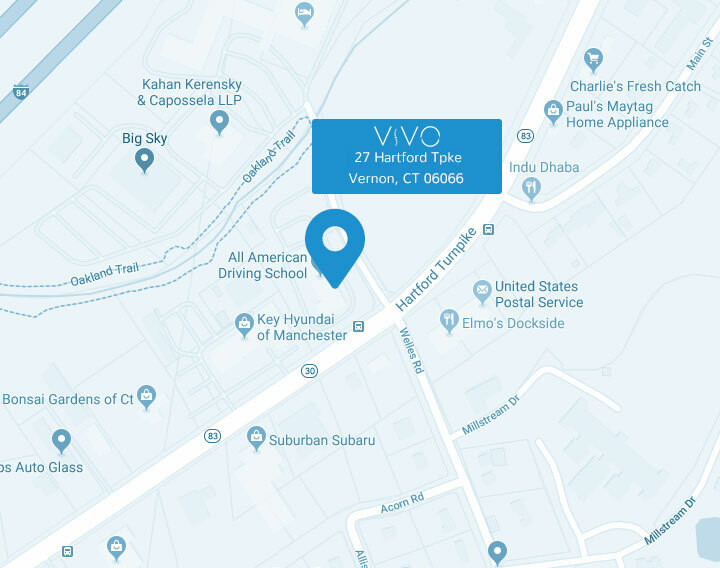 ViVO Chiropractic is proud to offer flexible appointments, walk-in visits and affordable care plans for patients of all walks of life—ask about our family plans! I would not be as healthy as I am now if I had not tried chiropractic care. I would much rather be treated by a professional chiropractor than have surgery or take drugs. I know it works and I will continue maintenance care because I will continue my active lifestyle. Thank you for helping me Dr. LaVoie! I get happy just walking in here. After some regular visits, a tree fell on me. Luckily, I was already seeing a great chiropractor, and he quickly re-evaluated me and got me back to fully functional again. At this point I come for the friendly environment and “preventative maintenance. My entire family has benefited from the chiropractic care we have received. I have recommended chiropractic care to many of my family and friends over the years, and I recommend Dr. LaVoie without reservation. After several years of waking up each morning with numbness in my fingers and not even being able to turn the dial on the radio, Dr. Chris realigned my vertebrae in my neck and resolved my problem in just a few months. Now I can run again. I also sleep better because I no longer have discomfort during the night. Headaches are something I no longer have to worry about. I don’t suffer with them anymore. Chiropractic care is amazing relief with no side effects from drugs, its natural and hassle free! My condition is improving, virtually pain free and I’ve increased my height by 1/4 inch just by following my treatment schedule. Absolutely amazing staff, I arrive and leave with a smile every time! Been going to Dr. Chris for many years now, and I cannot say how much he has helped me with my problems. It is part of my weekly routine to stop by for a quick adjustment. Friendly staff are a plus! The atmosphere is very welcoming, and the doctors/staff really care about individual success. I met them at the Cornfest in September 2016 and it was one of the best decisions I have made. The staff is always very nice and accommodating. I would highly recommend them to anyone! My life is completely different now that I come here. I feel like Rocky Balboa at the top of the stairs after my adjustments! I could feel the difference immediately. In about less than a month, I was feeling much better physically and mentally. I was now able to get out of bed and leave my house without being in pain and suffering from anxiety. I am so very grateful to Dr. LaVoie for helping me fix all my aches and pains. He is an excellent chiropractor who does his job well. After 3 specialists and over a year in pain, Dr. LaVoie has me sleeping like a champ. I feel like I’m 15 again. I feel comfortable and safe, and the staff is always friendly and accommodating. This was the first time I had been totally pain free for nearly 20 years! Don’t be afraid to try chiropractic. I genuinely believe that if not for Dr. LaVoie, I would be in a wheelchair at least, or at best have needed back surgery. As it is I am as active as I can be considering my age (64) and my arthritic condition. I am still cycling and hiking and living life to the fullest! Try chiropractic – It works! I started going for low back pain due to my job. What I didn’t realize is how my overall feeling of health, as well as my mental clarity, would greatly improve! I had less affects from colds this winter and my stress level is much more manageable! I have work to do on my back and neck, but I feel amazing! At the beginning I was skeptical of chiropractic, but when I was helped with my hip pain when nothing else seemed to work, I began to understand the benefits of chiropractic care. I didn’t want to have cortisone shots, and I didn’t have to, thanks to Dr. LaVoie. Chiropractic is life changing! Thank you, Dr. April Little! The doctors and staff are competent, friendly, and helpful. I was told by a highly respected neurosurgeon at UConn that if I did not get an operation within a year I was going to be in a wheelchair. After a couple of weeks I felt like a new man. 5 years later and I am a believer! The best Chiropractors I have even seen! They truly care about you and work with you and your schedule. The staff are super friendly and efficient. They not only treat myself but my husband and two sons. Make sure you call the wonderful Kelly to schedule a visit with Dr. April or Dr. Molly – you will not be disappointed! It is always a safe place. I came in crawling, I left dancing and I have been dancing ever since. This feels great!!! Dr. LaVoie and staff are amazing. I can honestly say without Dr. April Little and her AMAZING chiropractic skills I would not be where I am today! Before chiropractic care I suffered from severe lower back and hip pain. I was unable to ride my motorcycle for long periods of time. Now I can enjoy my bike rides pain free thanks to the welcoming and caring staff. Very friendly, personable, upbeat professionals! For my first visit, I felt like everyone had known me for years. Great atmosphere and morale. Awesome job! The staff was extremely friendly and more than accommodating. I was seen the same day I called. I feel very hopeful that they will be able to help me. Loved the energy in this office. I cannot express how grateful I am. Great great place, would recommend to everyone and anyone.